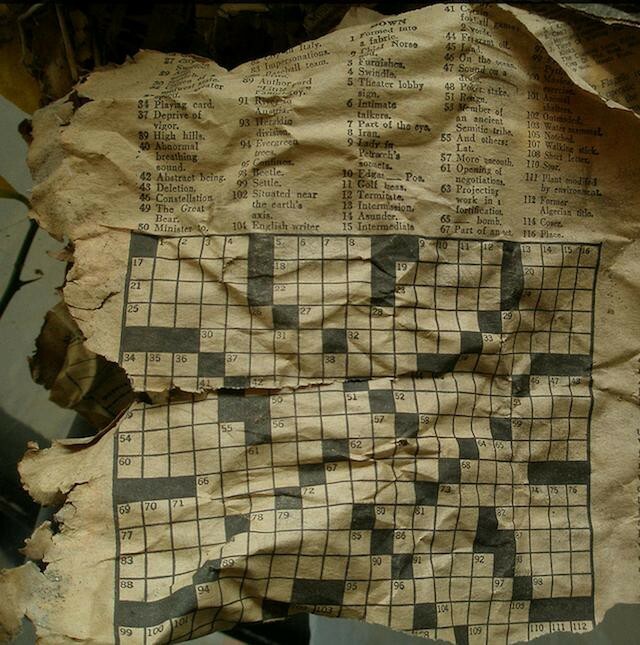 Crossword puzzle from April 25, 1965, found by David Prasad. The crossword puzzle, which turns one hundred years old this Saturday, is a native New Yorker. Contrary to popular belief, it was not born in the virtuous, cosmopolitan New York Times but in the back pages of the now long-defunct yellow-journalism daily The New York World, among the ads for breast-augmentation serums. In 1913, The World was one of scores of city papers grabbing at readers with sensational and morbid hooks, high-contrast photos of men in hats standing over fresh corpses, headlines about the secret lechers and killers of the grim urban anonymous. These were the crossword’s childhood neighbors. The crossword, originally called the “word-cross,” was adapted by Arthur Wynne, editor of The World’s games and puzzles section, from an as-yet-unstandardized puzzle found in Europe since the late nineteenth century (Wynne himself was British). Wynne did not so much invent as re-present and popularize the feature. There seemed to be no sense at the paper that it might be a hit, until it did. And it may well not have been if it weren’t for Manhattan. The city was a fertile medium in which to grow, for largely the same reasons that urban areas support crossword solving today — commuters on mass transit need something to do. What better way to ease a weary morning brain into the day than a mildly challenging, twenty-minute word game? You fill it out on the go and then toss the paper in the ashcan outside the office, with a sense of satisfaction at having wrapped up your task completely. According to Uncle John’s Bathroom Reader, “The B&O; Railroad put dictionaries on all of its mainline trains for crossword-crazy commuters.” The subway, still young then, discovered a soul mate. Urban transportation and crosswords grew up together. Soon, most of the city’s newspapers had their own puzzle feature, joined by other metropolitan papers like The Boston Globe, and by 1925, the trend was peaking. New York celebrities, including Governor Al Smith and Will Rogers (who lived and entertained in the city at the time) even wrote their own puzzles, while baseball players and beautiful people were routinely photographed solving them. But like many New Yorkers who stick around for a few years, the initial thrill soon wore off. When one is neither young nor rich here, but doesn’t yet want to leave, there is usually only one choice: get a steady job. The New York Times, after almost thirty years of openly denigrating the “fad,” got on board in February 1942, just as the United States was entering World War II. It was a victory gimmick, a distraction from all that. The Times puzzle debuted near photographs explaining the differences between various models of biplane. Margaret Farrar, former assistant to Arthur Wynne and probably the most important figure in the history of the crossword, was its first editor. She did away with the irregular rules and grid shapes that other papers had employed, inaugurating the square grid and symmetrical pattern with which we are now familiar. The structural rules she put in place were largely aesthetic, and they created an iconic daily artifact. Farrar edited the puzzle brilliantly until 1969, when she was forced into retirement. It was under her that the crossword became essentially synonymous with The New York Times. But the ensuing two decades were mediocre, especially at the Times. Will Weng is remembered fondly by some, and subsequent editor Eugene Maleska by vanishingly few. Weng’s puzzles could be inscrutable, but he did at least have a sense of humor. Maleska, who served as a district superintendent of schools in the Bronx, brought an administrator’s gruffness and sober passion for educational basics to bear on his editing. Maleska’s puzzles were high-brow handjobs. Esoteric entries like CINCHONA (“Quinine-supplying tree”) served little purpose except to stroke the egos of those schooled in a particular version of classical European knowledge — geography, botany, theater. Perhaps the crossword was moribund in this period because America had its collective mind elsewhere in the 70s and 80s, or perhaps the pendulum of propriety simply had swung a bit too far. It was only in the late 80s, with the ascendance of the whiz kids at Games Magazine and elsewhere, that the crossword returned to glory. When Will Shortz left Games and took over at the Times in 1993, he opened the door wide to pop culture and punny humor. The puzzle got funnier and fresher, and the variety of themes expanded greatly. Shortz has had a tremendous effect on both the visibility and quality of crosswords since the early 90s, and his influence remains outsized. He has also hosted the prominent American Crossword Puzzle Tournament, since before he began as editor, helping transform the puzzle world into a tightknit community, and remained ubiquitous in the media. With Shortz, the crossword attained a human warmth in the popular imagination. There have been highs and lows in the first hundred years. But, from the vantage of the archive, crosswords are transparently much more than a pastime. They are like dictionaries of human awareness. Every clue is a truth about the world on which the constructor and solver must shake hands. In retrospect, those truths are not always nice. In 1926, for example, constructor W.P. Wooten clued the word WOMEN as “They’re uncertain and coy” in the New York Herald Tribune. Crossword clues must pass the so-called substitution test, such that the answer can replace the clue in a sentence and vice-versa. So the word SEE can be substituted for “Watch,” just as in a thesaurus. The fact of women’s uncertainty and coyness was, for a significant percentage of the Herald Tribune’s readership, a given. Fast-forwarding to the Maleska era, it was similarly assumed that an intelligent person would know the name of an Andean medicinal plant genus. The editor and audience sign a tacit contract that the grid can be filled using common knowledge, and so they must agree on what constitutes common knowledge. Close readings of crossword puzzles thus reveal ontological agreements that float around in certain corners of the world at particular times. There are few other endeavors that do this so vividly. So where does the crossword go next? We are now, decidedly, in the era of indie/digital crosswords. But “The Internet” is an obvious and insufficient answer. Plenty of newspaper puzzles are already playable on apps, and some exciting newer ones are online only. But even these are still frequently printed and enjoyed offline, often along the same subway and elevated train routes where the game first rode to prominence. Amazingly, paper and pen/pencil are still king. Devices provide some new contexts and the opportunity for certain kinds of gimmicks, but Farrar’s rules and the printed page are still vital for the puzzle. Rev. John Graham’s announcement puzzle. Constructors and editors might make some progress by embracing what’s unique about crosswords as expressive bearers of shared knowledge. Crosswords in this regard are a peculiar and quite postmodern kind of art — densely packed semantic containers that are utterly, immediately disposable. To say that puzzle makers should think more about their work as an art form is not to suggest that they be more genteel or self-reflexive. Nothing much needs to change about the crossword, including the sense that it’s all in good fun. But there may yet be room for puzzles that leave us feeling ambiguous or bittersweet. A cryptic crossword setter for The Guardian, Rev. John Graham, revealed in a puzzle a year ago that he had inoperable cancer; he published his last puzzle in November, days before his death. Most creative works, from novels to TV to movies to photographs, can and do evoke all manner of emotion. Crosswords have barely dabbled in much other than humor, but they could. The proliferation of critical puzzle blogs where construction is taken seriously, suggest that there may be room for doing so. This is an area I hope to see mined in the coming years, if only as a niche. 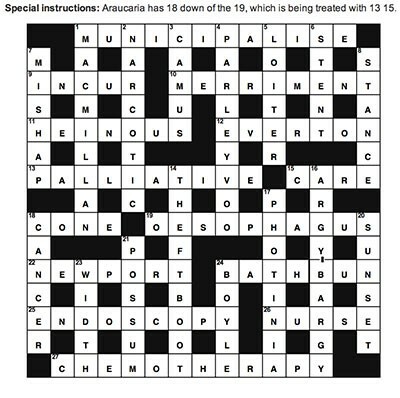 Meanwhile, the disposability of crosswords offers a number of possible new angles, with which figures like Peter Gordon, Brendan Emmett Quigley, and Amy Reynaldo and Trip Payne have been leaders in experimenting. Gordon writes puzzles based on events from the previous week, Quigley seeds his grids with of-the-moment entries, and Reynaldo and Payne edit themes that might reference celebrity news stories from as recently as yesterday. This is a scale of freshness that simply isn’t possible with newspaper crossword publication cycles. The best contemporary puzzles weave modern references with knowledge of an older vintage. The temporal scales can, in subtle ways, even address each other, as in a recent American Values Club puzzle “written” by a just-emerged cicada (whose cluing was precisely seventeen years out of date). Finally, crosswords can still make huge strides in compensation. The existing model sees constructors vastly underpaid given the scarcity and value of their work, and frozen out of the secondary market for reprints almost entirely. This is the case in spite of the fact that puzzles, unlike commentary and journalism, have not been devalued by the ubiquity of free content online. Pay-to-play subscription crosswords have grown up just as print has declined, and there are quite a few profitable ones now. Digital crossword subscriptions make more money than ever for The New York Times, even as the paper seeks ways to make up for declining circulation. Crosswords thus have a chance to be leaders in giving just compensation for intellectual work, bucking an otherwise powerful historical trend. Crossword outlets can elevate themselves by raising pay and including royalty-sharing clauses, becoming a more robust medium by attracting higher-quality work. Not many creative fields have that kind of opportunity today. I have a daydream in which I publish a Marxist-Leninist tract in Forbes about generous pay as late capitalism’s great remaining market inefficiency, with the crossword industry as linchpin. I’m sanguine about the future of crosswords in their current digitally available but paper-solvable form. What has likely led to yet another puzzle renaissance in the past decade isn’t technology so much as the formal creativity and play with disposability that many of the above-linked puzzles have embraced. The centennial of the crossword’s beginnings prior to LaGuardian ambition, Lindsaian crisis, and Bloombergian technocracy sees it linked but no longer moored to urban places; the world thinks, plays, and moves differently now. I’ll ask you to fill in the rest. Ben Tausig is editor of the American Values Club xword, and author of the weekly Ink Well feature. His most recent book is called The Curious History of the Crossword. He has a Ph.D. in ethnomusicology, and has studied music and protest in Thailand. He’s written for the Awl, the Hairpin, and others.